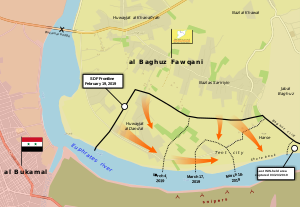 The Battle of Baghuz Fawqani was an offensive by the Kurdish-led Syrian Democratic Forces (SDF), assisted by American-led coalition airstrikes, artillery, and special forces personnel, that began on 9 February 2019 as part of the Deir ez-Zor campaign of the Syrian Civil War. The battle, composed of a series of ground assaults, took place in and around the Syrian town of Al-Baghuz Fawqani in the Middle Euphrates River Valley, near the Iraq–Syria border, and was regarded as the territorial last stand of the Islamic State of Iraq and the Levant (ISIL) in eastern Syria. After shrinking the Islamic State into a densely populated cluster of hamlets and a tent city along the riverside within the first week, the SDF realised that a greater-than-anticipated number of civilians, most of whom were relatives of the mostly foreign ISIL fighters, were still in the enclave. With Coalition oversight, the SDF took an incremental approach to the battle, launching fierce assaults then pausing to allow surrendering fighters, hostages, and families to evacuate in order to minimize civilian casualties. The "trickle-out" strategy, coupled with stiff, fanatical resistance by veteran Islamic State jihadists within a small but dense area, prolonged the battle into a protracted siege. The SDF officially declared final victory over the Islamic State in Baghuz Fawqani on 23 March, marking the end of ISIL-controlled territories in Syria. Since September 2017, the Syrian Democratic Forces (SDF) had been on a campaign to wrest territorial control from the Islamic State terror group in eastern Syria. 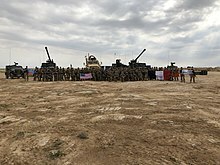 The SDF's advances were supported by American, British, and French forces from the CJTF-OIR Coalition via close air support, French and American artillery, and American special forces assistance and oversight. The SDF launched its third and final phase of their campaign in September 2018, gradually capturing the remaining ISIL pocket of territory straddling the Euphrates river near the Iraq-Syria border. By 1 February 2019, ISIL was reduced to four square kilometers of territory, boxed in against the river with the SDF advancing from the northwest, Syrian government forces blocking river crossings, and Iraqi forces deployed to prevent cross-border infiltrations. The massive exodus of civilians complicated advances, with the SDF pausing its advance for almost 10 days prior to the battle. Within the 10 days preceding the battle, over 20,000 civilians fled the enclave. The SDF stated that a number of foreign hostages, including missing British journalist John Cantlie and the kidnapped Italian Jesuit priest Father Paolo Dall'Oglio, were possibly being held in the enclave. On 9 February 2019, France's Defense minister Florence Parly visited Firebase Saham, a joint French-U.S. artillery fire support base near Al-Qa'im, Iraq, that supported the SDF's anti-ISIL campaign. Meeting with French forces there, Parly told them not to be distracted and that France "is determined to complete this fight against those who have struck her," referring to ISIL terror attacks in France in recent years. The Syrian Democratic Forces announced the decisive, "final battle" against the Islamic State enclave on the evening of 9 February 2019. Available SDF forces in the offensive consisted of around 15,000 fighters, backed by Coalition artillery and close air support, along with assistance from the U.S. Army Special Forces and, according to an SDF commander, the British Special Air Service. It was initially estimated that ISIL still had around 400–1,000 of its most committed, battle-hardened jihadist fighters resisting to the bitter end, though general estimates still varied widely. The battle began with a heavy preemptive bombardment throughout the afternoon from SDF mortar teams and U.S. bombers, including B-1B Lancers, with intermittent sniper engagements and machine gun clashes throughout the day. Fighting continued into the night with the SDF only advancing until nightfall as Coalition flares illuminated the battlefield amidst numerous air raids and "constant" shelling of al-Baghuz Fawqani; local sources reported night fighting over the Baghuz-Bukhamal bridge as well. The SDF reported the deaths of 37 ISIL members along with the destruction of 19 enemy forward positions, four roads, one mortar piece, one motorbike, and one weapons cache during the preemptive bombardment. Throughout the night of 9 February and into the morning of 10 February, the SDF made early advances, seizing 41 tactical points within a total of 2 square kilometers of land while repelling an ISIL counterattack at 4 a.m. local. The SDF reported killing many ISIL fighters while only losing two of their own. They also reportedly secured a humanitarian corridor for 200 civilians to flee the fighting. SDF spokesman Mustafa Bali, commenting on alleged secret negotiations between ISIL, the SDF, and the Coalition, stated that ISIL representatives had asked for safe passage out of the pocket. Bali said that the SDF would "fight until the very last minute"; however, American negotiators allegedly stated that safe passage to the Idlib Governorate, dominated by ISIL's rival Hayat Tahrir al-Sham, was an offer still on the table. Meanwhile, commenting on the battle, U.S. President Donald Trump tweeted "The U.S. will soon control 100% of ISIS territory in Syria." By the morning of 11 February, another 1,500 civilians had fled the area in a column of 17 trucks filled with men, women, and children, some identifying as Iraqi. Hundreds of civilians continued to stream out of the enclave into SDF-Coalition makeshift screening centers established for filtering out fleeing jihadists. One YPG commander stated that some desperate ISIL militants would resort to wearing women's clothing when fleeing. "[ISIL fighters] have been trying to escape in women's clothes," the commander said, explaining that "some of them dress as women because we don't ask the women to raise their hijab." The Coalition's combat missions continued; Acting U.S. Defense Secretary Patrick Shanahan stated the SDF were making "significant progress" despite poor weather conditions. Poor visibility such as overcast weather or dust storms typically benefited ISIL fighters as it concealed some of their ground deployments and hindered SDF-Coalition reconnaissance. The Coalition said that despite the poor weather, airstrikes were being called in "whenever possible". ISIL elements were entrenched and fortified, leaving the SDF to rely greatly on Coalition air power to soften defenses and dislodge strongpoints. The U.S. bombed a mosque in the town allegedly being used as an ISIL command and control center to direct attacks and deploy suicide car bombs (SVBIEDs) against the SDF. "This mosque lost its protected status when ISIS deliberately chose to use it as a command and control center," the Coalition stated. The mosque strike came amid reports that ISIL was deliberately using human shields in order to deter Coalition targeting and impede the SDF's advance. Syrian state media reported that about 70 people were killed or wounded on the edge of the town after an airstrike hit a settlement where hundreds of people were taking shelter. A Coalition spokesman responded, "we are aware of open source reports of alleged civilian casualties. We take all allegations of civilian casualties seriously, and understand there is a lot of misinformation as well." The sound of explosions and gunfire echoed dozens of kilometers away from the battlefield as intense Coalition airstrikes and SDF missile attacks continued; eyewitnesses described the mushrooming columns of white and dark grey smoke billowing over the skyline as warplanes and missiles streaked through the sky. The Britain-based Syrian Observatory for Human Rights (SOHR) monitor said the SDF was advancing at a slower momentum than initially expected due to ISIL's usage of tunnels to navigate the battlefield along with deploying snipers, VBIEDs, anti-tank guided missiles, and land mines against the SDF, forcing them to simultaneously conduct de-mining operations with every advance. United States Central Command (CENTCOM) commander Gen. Joseph Votel, who oversees the United States' middle east operations, commented on the battle during a trip to Cairo. "It's a relatively confined space, it's heavily urbanized, it's laden with a lot of explosive hazards, improvised explosive devices for example, and kind of a prepared defense by ISIS," he said, emphasizing the asymmetrical warfare commonly associated with fighting ISIL. Estimates on the number of remaining ISIL militants in the enclave varied; SDF officials and SOHR estimated there were around 3,000 mostly foreign ISIL jihadists remaining, though previous Coalition estimates put the number at about half that. On 10 February, SDF spokesman Mustafa Bali said up to 600 fighters were still present in Baghuz Fawqani proper. Claims of ongoing backdoor negotiations also persisted, though an SDF source denied any such talks were happening, saying that the SDF demanded an unconditional ISIL surrender. Meanwhile, Italian media reported freelance photographer Gabriele Micalizzi was badly, though not critically, wounded in the head by splinters from an rocket-propelled grenade. Micalizzi was airlifted by the Coalition to Baghdad to be evacuated back to Italy. The Observatory said 13 ISIL militants, including five suicide attackers, were killed as well as six SDF fighters in recent fighting. 16 civilians were reported to have been killed in airstrikes by the end of 11 February. On 12 February, civilians continued to flee on the back of dusty trucks filled with women and children bound for SDF-run refugee camps in northeastern Syria. The civilian truck drivers said 18 foreigners were among the dozens of civilians fleeing with them, including Russians, Turks, and Ukrainians. Regional and foreign journalists clambered over the edges of the trucks to find non-Arabs among the civilians, some shouting "France? France?" One fleeing civilian, a mother of five, described the bombing as "unimaginable". "There was no food. We ate grass from the ground like sheep... Daesh had blocked the roads and smugglers wanted thousands of U.S. dollars," she added. Two Muslim-convert French mothers that paid to be smuggled out of the enclave claimed that "massacres" were taking place inside the town while many others starved. Only Syrian and Iraqi women were allowed to be smuggled out, according to the women. Violent clashes continued throughout 12 February; Coalition airstrikes bombarded entire districts, such as the Sheikh Hamad neighborhood, as the SDF captured the Baghuz-Bukamal Bridge and made advances in the Al-Khanafirah neighborhood. A fleet of 15 vehicles carrying U.S. soldiers was seen reinforcing a secondary front line as ISIL units used ambush tactics and fielded machine guns and anti-tank guided missiles against SDF positions. Local eyewitnesses said ISIL was using trash and tire fires to fill the skyline with thick smoke to complicate Coalition airstrike capabilities and to make the air harder to breathe for SDF troops. Syrian reporter Mushin Khalil reported at least 14 SDF fighters were killed on the 12th in an ISIL counterattack that involved a suicide bomber. At the end of the day, SDF spokesman Mustafa Bali announced that ISIL controlled only 1 square kilometer of territory, and that all the people remaining there were ISIL militants and their families. Meanwhile, SOHR reported that U.S. officials demanded ISIL surrender 40 tons of stolen gold the group possessed in exchange for safe-passage to an "undisclosed location" during alleged ongoing negotiations. On 13 February, reports emerged that ISIL had executed more than 15 of its own fighters for attempting to surrender, seven of whom were French nationals. After clearing the Sheikh Hamad neighborhood, the SDF were able to break through ISIL defenses and capture the town center, forcing tens of ISIL jihadists to flee towards as-Safafinah with the rest of ISIL's militants held up at a nearby refugee camp near the town orchards. The SDF reported receiving 425 civilians fleeing the pocket within the past 24 hours by truck and by foot; some of the fleeing women – many of them wives of ISIL fighters – had gunshot wounds, likely from ISIL forces shooting at their own fleeing wives in hopes of using their families as both human shields and bargaining chips during negotiations. SDF and Coalition personnel singled out fleeing male civilians during processing and were reportedly using retinal scans, fingerprinting, and other biometric data gathering tools when screening them for jihadist ties. Meanwhile, the International Rescue Committee stated 51 people had died on the way from the enclave to the Al-Hawl refugee camp or shortly after arriving, most in the past few weeks. The majority were toddlers or newborn babies dying from hypothermia via long treks through the cold desert terrain with their relatives. On 14 February, journalists reporting outside of the town said things were "quiet" on their end, as the pace of the SDF's advance had slowed. A few civilians came out overnight – the smallest batch in weeks – according to one aid worker on site. An SDF official said that clearing operations were continuing while the day's fighting mainly took place on the town's northeastern axis where he added that combatants were fielding new "thermal weapons." The SDF reported capturing a clinic used for treating ISIL troops and a weapons cache full of ammo, including 10 mortars, an artillery piece, and a car bomb rigged with explosives on the northeast axis. SDF fighters on the southeastern axis reportedly discovered the bodies of 26 ISIL troops late 14 February, including that of a child soldier. Rainy weather, fleeing civilians, and ISIL ambush tactics continued to bog down SDF advances on 15 February as engineering teams conducted continuous tunnel clearing and de-mining operations on the northeastern axis. Coalition surgical strikes were reportedly reduced to a maximum of two a day as Adnan Afrin, a Kurdish commander, said the SDF wanted to avoid "causing a massacre" due to ISIL bringing hundreds of civilian hostages out from underground tunnels in recent days. SOHR reported that a Coalition convoy of seven trucks, three ambulances and other vehicles headed towards the remaining ISIL-held area aiming to draw out the remaining jihadists and their families. At the end of the day, 200 ISIL fighters surrendered. Speaking at the al-Omar oil field staging area on 16 February, SDF commander Jiya Furat stated that ISIL's remaining territory was reduced to "700 square meters",[note 1] and that a declaration of victory will be announced in "days." Furat added that 10 previously captured SDF members were also released by ISIL as the terror group again demanded to be allowed to leave for Idlib. The SOHR stated that the SDF was almost done asserting control, but residual ISIL fighters were hiding out in tunnel networks with hostages. Two Coalition airstrikes were also reported in the area. Civilian evacuations with minor front line skirmishes continued throughout to the 18th. On 19 February, with ISIL's territory reduced to a small stretch of encircled hamlets composing a couple hundred square meters, the SDF affirmed their ultimatum to ISIL: surrender or die in battle. The SDF continued to operate cautiously as dozens of trucks evacuating civilians regularly streamed in and out of the region. The United Nations expressed concern over “the situation of some 200 families, including many women and children, who are reportedly trapped" in the besieged ISIL enclave. By nightfall, two Coalition airstrikes were reported in the area as many ISIL fighters seemed to have refused to surrender. SDF officials stated on 20 February that they wanted to evacuate every civilian before storming the remaining "120–300 ISIL fighters", believed to be holed up at the Hawi al-Dandal hamlet area with "at least 100 civilians" present. On 21 February, SOHR reported about 260 mostly foreign ISIL fighters remained encircled in the farmlands and in nearby tunnels, seemingly preferring to die fighting than surrender to the SDF. The SDF predicted the last batch of civilians would be out of the area by the 21st, but no civilians were seen leaving during the day. Journalists reported seeing warplanes and U.S. attack helicopters scouting the area, but no signs of combat. Meanwhile, French sources reported that the Coalition was verifying whether French jihadist Fabien Clain was killed in an airstrike the day prior that also left his brother Jean-Michel seriously wounded. The Coalition confirmed Clain's death on 28 February. The SDF said they were "surprised" at the number of civilians still being held in the enclave. Groups of civilians continued to flee in the direction of SDF forces, some escaping through tunnels and wrecked buildings. Human Rights Watch quoted interviewed civilians as saying that smugglers were charging 400 U.S. dollars per person. An SDF commander stated that it could take four to five more days before all civilians were completely out of the area of operations. In the early hours of 26 February, another batch of ISIL fighters and their families surrendered to the SDF. The United Nations Office for the Coordination of Humanitarian Affairs (OCHA) for Syria stated 9,000 people had evacuated the enclave within the previous 72 hours, 99 percent of which were women and children. SOHR reported 1,400 people had evacuated the area since 24 February, including dozens of suspected ISIL militants. Recent Coalition airstrikes in the area focused mostly on pushing back ISIL fighters that blocked roads and escape routes in an effort to prevent civilian hostages from escaping in prior weeks. "Between 10 February to 23 February, the Coalition conducted 186 strikes consisting of 426 engagements, including damaging or destroying: 285 ISIL tactical units, 189 fighting positions, 50 supply routes, 22 staging areas, 16 boats, 15 vehicles, six petroleum oil tankers, six aircraft operations areas, six VBIEDs, four command and control "nodes", three weapons caches, three heavy machine guns, three pieces of engineering equipment, two buildings, two tunnels, one cave, one IED production facility and one petroleum oil storage facility. The Coalition defines a "strike" as "one or more kinetic engagements that occur in roughly the same geographic location to produce a single, sometimes cumulative effect in that location." On 28 February, SDF spokesman Adnan Afrin announced discovery of a mass grave found 10 days ago in the town. It contained dozens of bodies, including of men and women while heads were also found in the grave. The SDF was trying to confirm whether they were Yazidis and Islamic State members. A video of Furat FM showed a mass-grave. The outlet's executive said that most of the bodies were apparently shot in the head. SDF spokeswoman Lilwa Abdulla confirmed they found large number of Yazidi bodies though there was no specific number. Locals have however said the corpses were victims of airstrikes. On 1 March, the Free Burma Rangers, one of the few aid groups in the area, said 15,000 people had fled the Baghuz area within the last month. At a screening center 20 kilometers away from Baghuz Fawqani, one Egyptian woman told reporters that ISIL was preventing men under 40 from quitting the redoubt, including her 27-year-old husband, in expectation of a final battle. According to media reports, some of the evacuated ISIL brides still proclaimed loyalty to the Islamic State and its leader. Some even shouted jihadist slogans from the back of fleeing trucks. "Abu Bakr Baghdadi will prevail," one woman said. "We left because God created a reason to get out of here, but the Islamic State will always prevail. Abu Bakr Baghdadi is in the tunnels and they will bring victory." As reporters left, the woman and her children shouted, "The Islamic State will remain!" 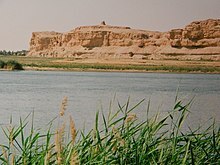 At 6:00 pm local time (16:00 GMT) on 1 March, three weeks into the assault on Baghuz Fawqani, SDF spokesman Mustafa Bali announced that the standoff with ISIL was over and that SDF units had began storming the remaining riverside encampments, which were a tent city said to be atop a network of caves and tunnels being used by the entrenched jihadists. Bali expected a "fierce" battle as he said that the SDF resumed ground operations only after the evacuation of the last batch of civilians willing to leave and following the previous release of captured SDF fighters. "The people we evacuated today told us that no civilians were inside and that those still inside did not want to leave," Bali stated. He added that SDF units would advance cautiously to avoid IEDs and land mines, and that any civilians encountered will be isolated though units will advance onward. Reports of heavy fighting and increased Coalition air presence proliferated. Bali, who said he expected the battle to be over "soon", stated that the SDF were advancing on two fronts with their units fielding medium to heavy weapons. At least three SDF fighters were injured in overnight fighting. By noon on 2 March, ISIL were deploying snipers, booby traps, drones, and "thermal missiles" against the SDF as U.S. helicopters circled the area. Black smoke occasionally filled the sky, apparently from airstrikes. An SDF spokesman, Zana Amedi, downplayed the SDF's dependence on air power in the assault due to jihadists using tunnels and human shields, saying “Now it’s mostly clashes. There are almost no airstrikes this morning. There were few airstrikes in the morning and nothing else after that.” Commander Adnan Afrin said the 1 kilometer buffer zone between front lines had been subsumed in the opening advance; he added that there had so far been no suicide attacks, though some land mines went off. He also stated that eight SDF personnel were wounded so far, some critically. 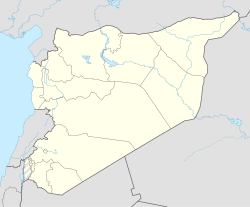 The SOHR reported 10 ISIL fighters had been killed in recent clashes, adding that Syrian government forces and their allies clashed with ISIL militants that tried to infiltrate/escape cross to the west bank of the Euphrates river, which physically separates Syrian government and SDF territory; the engagement left seven jihadists dead. ISIL began deploying VBIEDs using cars, motorbikes, and bicycles against SDF positions on the night of 2 March, several of which were subsequently destroyed by both Coalition air raids and SDF fighters using snipers and rockets; ISIL also shelled approaching ground forces. An airstrike on an alleged ammunition depot set off a large explosion, causing a smouldering fire that led to continued secondary explosions into the next day, filling the sky with smoke. By the end of 2 March, SDF forces had made limited advances, capturing six tactical points and a hill overlooking the main ISIL camp. By 3 March, the SDF reportedly had 160 machine gun units stationed at 50 meter intervals along the front line as sporadic gunfire and SDF mortars and artillery continued to shell the camp. With ISIL offering stiff resistance during the daytime, the SDF largely advanced and conducted closer-range combat after nightfall under the support of U.S. helicopters and warplanes; the dug-in jihadists were "outgunned" and did not have night vision, according to the SDF. The SDF had lost three fighters and had captured 13 to 14 points by the end of 3 March, according to a commander. The SOHR cited local reports alleging that U.S. elements had deployed white phosphorus incendiary munitions in Baghuz; the deliberate use of the weapon in the presence of civilian areas is banned by the Convention on Certain Conventional Weapons. A Coalition spokesman flatly denied the allegations. Upon noticing the significant civilian presence still remaining in the area, the SDF again slowed down its general advance on 4 March. The move contradicted past statements that the assault wasn't going to begin until all civilians were out. "We’re slowing down the offensive in Baghouz due to a small number of civilians held as human shields by Daesh," Mustafa Bali said. The SDF opened a secondary humanitarian corridor to facilitate evacuations. Later in the day, SDF and Coalition officials stated that around 500 people, including 150 suspected ISIL militants, had surrendered, with 200 more expected to leave. The exact number of remaining ISIL fighters within the camp remained unknown; there were also continued concerns over just how extensive the underground tunnel networks were — some SDF fighters estimated that the tunnels extended for more than 2 kilometers. Meanwhile, local reports claimed that ISIL commander Jamal Khaled Masoulkh was killed in an airstrike in Baghuz Fawqani the night before. He was the deputy commander of the Islamic State, stationed in Raqqa (ISIL's former de facto capital), before he moved to eastern Syria. On 5 March, the SDF reported that 3,000 people had fled through the corridor since the slowdown on 4 March, with 10,000 people having fled in total since 10 February. One of the evacuees, Dorothee Maquere — the wife of deceased terrorist Fabien Clain — confirmed that his brother Jean-Michel Clain, who was critically injured from the Coalition airstrike on their position on 20 February, died on 3 March after an SDF mortar round landed near him. She also claimed that Hayat Boumeddiene, wanted by French authorities as a suspected accomplice in the January 2015 Île-de-France attacks, was killed in a separate strike during the prior week, which allegedly hit an ISIL safe house known as the "French House," where many French nationals were staying. Other interviewed evacuees corroborated these claims, though they could not be independently verified at the time. On 6 March, the SDF reported it had captured 400 ISIL militants overnight. The standoff continued by 10 March, with ISIL flags still seen flying over the besieged encampment. SDF fighters, perched atop rooftops just hundreds of meters away from the camp, saw "exhausted"-looking ISIL militants, women and children milling about, yet to surrender even with dozens of evacuation trucks flowing in and out daily. The presence of the jihadists' civilian families continued to delay the SDF's attempts to clear the camp. Later on the same day, SDF spokesman Mustafa Bali stated that tens of thousands of people, including at least 4,000 ISIL fighters, had surrendered to the SDF within the past month. He also stated that no more civilians had left the ISIL enclave that day, and that SDF fighters did not see any further civilians within the ISIL pocket. The second standoff came to an end on the afternoon of 10 March, with the SDF resuming the assault at 6:00 pm local time. Heavy ground engagements, including machine gun fire and snipers, were reported. The SDF stated that warplanes and mortars were targeting weapons arsenals in the camp, the destruction of which set sections of the camp ablaze. On 11 March, ISIL fought back with suicide attacks — four jihadists assaulted SDF positions, setting off their explosive belts, though only succeeding in damaging a "minesweeper," according to the SDF. 11 Coalition strikes were reported as SDF units fired on the camp from all sides with artillery, rocket barrages, and heavy weapons — they made limited advances, reportedly capturing an arms depot. Five SDF troops were wounded and one was killed, per the SDF. The SOHR reported that seven ISIL militants had been captured since 10 March. Completely besieged in Baghuz Fawqani, ISIL released propaganda film and audio recordings via its few social media outlets late on 11 March desperately urging its supporters abroad to stage attacks against the "Crusaders," a term used by jihadists to refer to western nations, and for followers to maintain their faith in God and the caliphate amidst complete territorial collapse. Syrian state media, citing local sources, alleged that recent Coalition air raids had killed more than 50 civilians in the camp; this was not confirmed by the Coalition. On 12 March, hundreds of people were seen surrendering to the SDF en masse, including fighters and their families. The SDF declared that the main battle was "as good as over" and they only needed to assert their control against resisting ISIL fighters holed up in complex tunnel networks in the area before declaring victory. They reported 25-38 ISIL militants had been killed since 10 March, while they themselves suffered three casualties. The Coalition had conducted around 20 airstrikes targeting weapons caches and command posts. Meanwhile, U.S. officials affirmed they did not believe any senior ISIL leaders remained in the area, assessing they had dispersed to other locations as part of the group's shift towards insurgency. On 13 March, mortars and airstrikes continued to pound the camp as the SDF made limited advances on some points. ISIL took advantage of a dust storm to mount two counterattacks using suicide bombers; the first attack was repelled but the second attack was more successful, killing four SDF fighters and wounding eight others. An SDF commander stated "The objective of our advance is to terrorize ISIL fighters so they surrender, and for the civilians to come out." The SDF reported around 3,000 more people, including suspected jihadists, had fled the area since 11 March, a testament to just how densely populated the area remained and the inaccuracy of earlier estimates. On 14 March, heavy clashes resumed after 1,300 jihadists and their relatives surrendered during a lull in fighting, many of them being foreign nationals. The YPG, the SDF's spearheading fighting force, reported that ISIL had deployed more than 20 suicide bombers during counterattacks within the past two days, and that at least 112 ISIL fighters had been killed since 10 March. On 17 March, the SDF released their figures on the operation since 9 January: 34,000 total civilians evacuated, 29,600 ISIL fighters and their family members surrendered, including more than 5,000 fighters, 1,306 ISIL militants killed, and 520 captured in operations. In turn, they put their casualties at 11 dead and 61 injured. On 18 and 19 March, the SDF announced significant progress, capturing ISIL's encampment and taking hundreds of wounded, surrendering militants into custody. The camp was the biggest remaining area held by ISIL in Al-Baghuz Fawqani, itself the last populated area the militant group held. SDF spokesman Mustafa Bali announced that the SDF had control of all of Al-Baghuz Fawqani, with the exception of a few pockets of resistance along the shores of the Euphrates river, where intermittent clashes continued with resisting ISIL fighters trapped between the captured camp and the river. The SDF also stated that more than 5,000 people could still be remaining in the areas yet to be captured by the SDF, as the vast tunnel network in Baghuz Fawqani made it difficult to estimate the precise number of people hiding there. Among the group that surrendered were suspects of the Manbij bombing that targeted U.S. soldiers in January 2019. On 20 March, in response to the developments, U.S. President Donald Trump predicted that the remaining ISIL holdout would be cleared "by tonight" during a speech at a U.S. Army tank factory in the U.S., saying, "The caliphate is gone as of tonight." Meanwhile, there were little signs of clashes in Baghuz Fawqani as Kurdish forces celebrated Newroz, the Kurdish new year, coupled with early celebrations of the battle concluding. An SDF official said that their forces were now largely searching tunnels of ISIL fighters as international journalists reported seeing ongoing evacuations of women and children in the camp. The Baghuz area remained largely quiet on 21 March as cautious clearing operations against mines, booby traps, tunnels, and camouflaged trenches continued; SDF personnel notably boasted that ISIL's black standard flags, which "instilled fear" in the populace, no longer flew over the town. Anticipation of a pending declaration of victory over ISIL resulted in premature local and regional reports claiming the entirety of the area was cleared and that the SDF had declared victory. Both SDF and U.S. officials denied that the town was fully liberated and warned against premature declarations. "We will continue fighting with our partners and allies, hunting ISIS wherever they may be," the Pentagon said, affirming that even after the declaration, ISIL as a group was not defeated and much of its leadership remained at-large. Coalition airstrikes on two pockets of militants were reported late in the day. The YPG said some of the strikes targeted one group of fighters that had been pushed to the edge of the river and the rest were aimed at a second group which had taken cover by the Jabal Baghuz cliffs on the outskirts of the town. ISIL's Amaq News Agency also released footage, recorded inside the camp during the siege, mocking U.S. efforts to topple the "caliphate"; videos released by ISIL in recent weeks reportedly depicted women joining the male ISIL fighters in combat while defending the camp. On 23 March, after weeks of civilian evacuations and fierce clashes with ISIL's most committed fighters, the SDF officially declared final victory over the Islamic State in Baghuz Fawqani, during a victory ceremony at the al-Omar oil field staging area, further north up the Euphrates River. Speaking at the ceremony, senior U.S. diplomat William Roebuck called the territorial defeat of the Islamic State a "critical milestone" that dealt a critical blow to the terror group, while also stressing that the group still remained a global security threat. At Baghuz Fawqani, journalists toured the war-torn ISIL encampment, with some describing it as a "wasteland" strewn with debris and stockpiles of unused mortars, rockets, and suicide vests; journalists noted that some corpses could still be seen and there was a faint smell of dead bodies in the air. Between 10 March and 23 March, the Coalition conducted 193 strikes consisting of 338 engagements, destroying 104 ISIL vehicles, 63 supply routes, 39 fighting positions, 31 VBIEDs, nine tactical vehicles, six fuel tankers, four weapons caches, two command and control nodes, one tunnel, one tanker for petroleum oil and lubricants, one mortar system, and one checkpoint. The SDF flag was raised over Baghuz Fawqani near the end of the battle, even as journalists reported mortars and gunfire near the cliff overlooking the camp, where airstrikes were reported during the previous day, as part of clean-up operations. Nevertheless, the battle concluded the SDF's multi-year Deir ez-Zor campaign and marked the territorial end of ISIL's self-declared "caliphate" that once ruled over as many as 8 million people and erased the borders between Iraq and Syria. ISIL's leader Abu Bakr al-Baghdadi remained unaccounted along with a number of foreign hostages who were presumed to be held in Baghuz Fawqani. Both before and throughout the battle, immense focus was put on the surrounding humanitarian situation in the ISIL enclave. The SDF helped transfer tens of thousands of civilians to internally displaced persons camps in northeast Syria while also holding over 1,000 captured ISIL suspects and their family members as a result of their conquests. Both the SDF and the U.S. began urging international countries to repatriate the captured jihadists during the later stages of the battle. On 21 February, an Iraqi official stated that the SDF had transferred 150 ISIL militants to Iraqi authorities under a deal involving a total of 502, making it the single largest repatriation of ISIL members thus far. On 24 February, the Iraqi Government stated that they received 13 more ISIL suspects from the SDF. Some Iraqi officials stated that all 13 were of French origin. By 1 March, the population of the Al-Hawl refugee camp soared past 50,000, due to the massive civilian evacuations from the Baghuz Fawqani region. Aid organizations feared that dysentery and other diseases could break out from the overflowing camp. The United Nations stated that 84 people, mostly children, died on the way to Al-Hawl, since December 2018. This number was raised to 100 by the end of the battle, and the refugee camp had swelled to at least 74,000 people. "According to the parameters of this world [...] we lost, but not according to the parameters of the next world." —Abu Abd al-Azim, ISIL fighter. ISIL has promised its followers rewards in the afterlife for their service at Baghuz Fawqani. On 7 March, in regards to the evacuations, CENTCOM commander Gen. Joseph Votel stated that he believed that surrendered ISIL fighters were largely "unrepentant, unbroken and radicalized," and were waiting "for the right time to resurge". "We will need to maintain a vigilant offensive against this now widely dispersed and disaggregated organization that includes leaders, fighters, facilitators, resources and toxic ideology," he added. This was supported by subsequent interviews with surrendered ISIL militants and some of their family members. By 9 March, one month into the protracted battle/stand-off, many evacuating ISIL militants and their families reportedly remained unrepentant and devoted to the "caliphate" and hoped for future "conquests". On 23 March, responding to the SDF's victory, French President Emmanuel Macron tweeted that "a major danger to our country is now eliminated, yet the threat remains and the fight against terrorist groups must continue." Hours after the battle, an NBC News crew vehicle in Syria was hit by an IED, killing the local driver but not harming the rest of the news team. It was not immediately clear whether it was targeted or unexploded ordnance. On 2 April, the SDF confirmed they were still conducting post-battle clearing operations in the Baghuz area, particularly in the vicinity of Jabal Baghuz mountain, where scattered ISIL elements continued to offer stubborn insurgency-style resistance via extensive cave and tunnel systems. On 5 April, about 200 ISIL prisoners at the Dêrik detention center in SDF-controlled al-Malikiyah attempted a breakout, simultaneously attacking prison guards and attempting to procure firearms. Local security forces and reinforcing SDF personnel responded quickly to the incident, along with the United States Air Force flying two fighter jets over the area as an intimidation tactic. The uprising was put down "peacefully", with no deaths reported. ^ Probably a misstatement, more likely 700 meters on each side which is 0.49 square kilometers. ^ a b El Deeb, Sarah (2 March 2019). "US-backed Syrian fighters advance on 2 fronts against IS". Associated Press. Retrieved 16 March 2019. ^ a b c d e Jeff Seldin (19 March 2019). "US-Backed Force Says It's in Control of IS Syria Encampment". VOA News. Retrieved 20 March 2019. ^ "Islamic State: 'Thousands of civilians' still trapped in Baghuz". BBC. Retrieved 17 February 2019. ^ a b c "Push on last IS enclave blunted by discovery of civilians". Yahoo! News. Retrieved 16 February 2019. ^ "U.S.-backed forces to attack Syria's Deir al-Zor soon: SDF official". Reuters. 25 August 2017. ^ a b Etienne Monin (18 February 2019). "Des civils quittent Baghouz, dernier réduit du "califat" : "Si tu es passée par ici, tu es sur la liste noire pour le reste de ta vie"" [Civilians leave Baghouz, the last cut of the "caliphate": "If you've been here, you're on the black list for the rest of your life"]. Radio France (in French). Retrieved 18 February 2019. ^ "80% of Manbij is liberated, 50 thousand civilians freed". Hawar News Agency. 2 August 2016. Archived from the original on 19 October 2017. ^ "The assassination of Abu Ali Bard, in the eastern countryside of Deir al-Zour". www.jesrpress.com (in Arabic). ^ "YPG: War on ISIS continues". Rudaw. 9 March 2019. Retrieved 19 April 2019. ^ "Abu Bakr al-Baghdadi, ISIL's secretive leader, fended off internal coup attempt: report". National Post. 11 February 2019. Retrieved 15 February 2019. ^ a b "Key ISIS figure killed during US Coalition attack last night". Al-Masdar News. 4 March 2019. Retrieved 4 March 2019. ^ "Coalition airstrike kills prominent ISIS commander "Ahmed Jamil al-Sayed" in Baghuz camp". Reddit. 4 March 2019. Retrieved 4 March 2019. ^ "Martyr Abdo Dushka forces are able to detonate a dummy ammunition car in Deir al-Zour". YouTube (in Arabic). 24 February 2019. ^ a b c Jared Szuba (29 March 2019). "ISIS's 'caliphate' was crushed. Now Syria's Kurd-led alliance faces bigger battles". Defense Post. Retrieved 19 April 2019. ^ Wladimir van Wilgenburg (18 March 2019). "Italian volunteer killed in fight against ISIS". Kurdistan24. Retrieved 18 March 2019. ^ Callimachi, Rukmini; Prickett, Ivor (6 February 2019). "A Desperate Exodus From ISIS' Final Village". The New York Times. Retrieved 16 February 2019. ^ "French army on the front line of 'final battle' against IS group". France 24. 10 February 2019. Retrieved 16 February 2019. ^ "First RAF Typhoon use of Brimstone missile destroys ISIS boat in Syria". The Defense Post. 22 February 2019. ^ "Exclusive pictures of final Islamic State group bastion". BBC News. ^ "February update". syriahr.com. Syria Observatoy for Human Righst. Retrieved 17 February 2019. ^ "IS Poised to Lose Last Syrian Enclave". ^ "Kurdish-led forces retake IS group hub in east Syria". France 24. 14 December 2018. Retrieved 15 December 2018. ^ a b "B-1B up in the air pounding Daesh". Map of Syrian Civil War - Syria news and incidents today - syria.liveuamap.com. Retrieved 16 February 2019. ^ "Another column, in Baguz village, of US Forces Cougar 4x4 TOW, Oshkosh and Humvees". Retrieved 18 February 2019. ^ "French guns on Iraq border aim to pin down IS diehards inside Syria " Capital News". Capital News. 11 February 2019. Retrieved 16 February 2019. ^ "'Heavy clashes' as US-backed forces make final push against IS". Yahoo! News. Retrieved 16 February 2019. ^ "French Nexter Aravis in Syrian village of Baghuz". Retrieved 18 February 2019. ^ Rikar Hussein (9 February 2019). "US-backed Fighters Launch Final Push to Defeat IS in Syria". VOA News. Retrieved 15 February 2019. ^ "Details of the first month of ISIS fade and its retreat to tunnels and trenches of Baghuz, about 21400 of them are out, about 2800 members and 72 children are dead, and tens of others are killed". syriahr.com. ^ "12 ISIS members blow themselves up in Baghuz farms at a time when about 1000 of them surrender and SDF sweep the area". syriahr.com. ^ "With the declaration of victory over it east of Euphrates, hundreds of families of abducted people call on the Coalition and SDF to reveal their fate at ISIS". syriahr.com. ^ Rempfer, Kyle (4 March 2019). "Final assault against ISIS camp launched Friday night and is still ongoing". Military Times. ^ "Hundreds Surrender in Last Islamic State Enclave as SDF Advance". Nytimes.com. Retrieved 26 March 2019. ^ "Syria force locked in battle with IS jihadists in holdout village". France24.com. Retrieved 26 March 2019. ^ CNN, Ben Wedeman, Hande Atay Alam and Ben Westcott. "Thousands of ISIS troops surrender amid attack on final stronghold in Syria". CNN. ^ "Bloody battle for last Isis territory nears end in Syria". The Independent. 12 February 2019. Retrieved 16 February 2019. ^ a b Said, Rodi (11 February 2019). "Coalition warplanes hit last Islamic State enclave in eastern Syria". Reuters. ^ hermes (15 February 2019). "ISIS militants mount desperate last stand in 1-sq-km 'caliphate'". The Straits Times. Retrieved 16 February 2019. ^ "The International Coalition continues its attack with the SDF on the last 4 square km remained for the organization that is collapsed almost completely amid fears for the lives of the citizens remaining in the area". The Syrian Observatory for Human Rights. Retrieved 17 February 2019. ^ "SDF attack Islamic State group's Syria enclave Baghuz". BBC. 10 March 2019. ^ a b c d e "US-allied Syrian force declares victory over Islamic State". The Washington Post. 23 March 2019. ^ Press, Associated (10 February 2019). "US-backed Syrian forces launch attack on final Isis stronghold". The Guardian. Retrieved 16 February 2019. ^ hermesauto (10 February 2019). "US-backed Syrian force launches 'final battle' against ISIS". The Straits Times. Retrieved 16 February 2019. ^ "Syria: IS resists US-backed forces in 'final battle' near Iraqi border". Euronews. 9 February 2019. Retrieved 17 February 2019. ^ "In Syria, U.S.-backed forces launch battle for last Islamic State foothold". The Washington Post. Retrieved 17 February 2019. ^ "SDF launches 'final battle' against Islamic State Syria enclave". Middle East Eye. Retrieved 16 February 2019. ^ "'Intense' clashes as SDF make last push against ISIS". Rudaw. Retrieved 16 February 2019. ^ "US-backed Fighters Launch Final Push to Defeat IS in Syria". VOA. Retrieved 16 February 2019. ^ "Coalition launches flares over last ISIS stronghold. 9 February 2019". Retrieved 16 February 2019. ^ "In Syria, U.S.-backed forces launch battle for last Islamic State foothold". Washington Post. ^ sdf1 (10 February 2019). "The clashes outcome in the war against terrorism". Retrieved 16 February 2019. ^ "SDF liberate 2km2, violent clashes continue – ANHA – Ajansa Nûçeyan a Hawar". hawarnews.com. Retrieved 16 February 2019. ^ "SDF liberate 200 civilians, displacement wave to liberated areas continues – ANHA – Ajansa Nûçeyan a Hawar". hawarnews.com. Retrieved 16 February 2019. ^ "A Desperate Exodus From ISIS' Final Village". 6 February 2019. ^ a b Mroue, Bassem; Karam, Zeina (11 February 2019). "Fierce battles near final IS foothold in eastern Syria". AP NEWS. Retrieved 16 February 2019. ^ "The US-led assault on the final ISIS stronghold in Syria is underway". 11 February 2019. Retrieved 20 February 2019. ^ "Fleeing Daesh terrorists resort to dressing as women to evade capture in eastern Syria". Al-Masdar News. 11 February 2019. ^ Press, Bassem Mroue, The Associated (12 February 2019). "US strikes ISIS-held mosque as Syria battle intensifies". Military Times. Retrieved 16 February 2019. ^ "US-backed Syrian forces battle to take last IS pocket". Channel NewsAsia. Retrieved 16 February 2019. ^ Correspondent, Barbara Starr, CNN. "Top US general says defeat in Syria wouldn't 'mean the end' for ISIS". CNN. Retrieved 16 February 2019. ^ "US, Partners Claim 'Significant Progress' as IS Makes Last Stand". VOA. Retrieved 16 February 2019. ^ "Islamic state in Syria: US-forces attack caliphate in eastern province". news.com.au. Retrieved 16 February 2019. ^ Desk, News (11 February 2019). "US unleashes massive attack on last ISIS bastion in eastern Euphrates". Retrieved 16 February 2019. ^ "Airstrikes kill 16 civilians as US-backed Syrian forces battle to take last Daesh pocket". Arab News. 11 February 2019. Retrieved 16 February 2019. ^ "'Civilians killed' as US-backed forces push to defeat ISIL". Al Jazeera. Retrieved 16 February 2019. ^ "Fleeing IS holdout, French women say foreigners still inside". Yahoo News. 12 February 2019. ^ Barić, Joško (12 February 2019). "Syrian War Daily – 12th of February 2019". Retrieved 16 February 2019. ^ "In eastern Syria, foreign families flee last Islamic State enclave". Reuters. 12 February 2019. Retrieved 16 February 2019. ^ "Twitter". Twitter. Retrieved 16 February 2019. ^ "SDF: IS Using Smoke, Suicide Attacks to Slow Advance on Last Syrian Stronghold". VOA. Retrieved 16 February 2019. ^ "SDF besiege IS mercenaries in last km2". Hawar News. 12 February 2019. ^ "Hundreds flee US-backed Syria battle for last Daesh holdout". Arab News. 12 February 2019. Retrieved 16 February 2019. ^ Desk, News (12 February 2019). "US demands ISIS handover 40 tons of gold in eastern Euphrates region: monitor". Retrieved 16 February 2019. ^ Desk, News (13 February 2019). "ISIS nearly wiped out in eastern Euphrates region as SDF troops capture Baghouz – map". Retrieved 16 February 2019. ^ "Syria's Democratic Forces captured a group of 27 Daesh elements from different countries and captured over 425 Civilians from Baghuz Fawqani last 24 hours". Map of Syrian Civil War - Syria news and incidents today - syria.liveuamap.com. Retrieved 16 February 2019. ^ "SDF: IS Targeting Civilians Fleeing E. Syria Stronghold". VOA. Retrieved 16 February 2019. ^ "IS defends last Syria redoubt, as family members flee". Yahoo! News. Retrieved 16 February 2019. ^ "IS militants cling to last square mile in eastern Syria". Associated Press. 14 February 2019. ^ Barić, Joško (14 February 2019). "Syrian War Daily – 14th of February 2019". Retrieved 16 February 2019. ^ "US-backed militia vows to 'end' ISIL in eastern Syria". 15 February 2019. ^ "Airstrikes on schedule. "Next one hits in 15 minutes". Coalition airstrikes on ISIS targets in Baghuz has decreased, max 2 a day, and remaining ISIS fighters and families resort to fields near Baghuz". Map of Syrian Civil War - Syria news and incidents today - syria.liveuamap.com. Retrieved 16 February 2019. ^ "Mines and tunnels slow final Syria onslaught on IS". 15 February 2019. ^ "Cornered Islamic State group fighters 'refuse to surrender to SDF, seek exit to Idlib'". alaraby. The New Arab & agencies. ^ "US-backed fighters closing in on Daesh gunmen in eastern Syria". Arab News. 16 February 2019. ^ "Daesh terrorists in Syria face two choices: Surrender or death". 19 February 2019. ^ "Air strikes hit Islamic State pocket as Syrian fighters press attack". Reuters. 19 February 2019 – via www.reuters.com. ^ "The last group of ISIS militants are mainly holed up at Hawi al-Dandal, they are ~120 elements, using ~100 civilian as a human shields, and they are led by an Iraqi terrorist. the SDF have evacuated by trucks on yesterday a group of civilians and ISIS surrendering elements/families". Today news from war on Daesh, ISIS in English from Somalia, Egypt, Afghanistan, Iraq, Syria - isis.liveuamap.com. ^ "As new batches get out towards SDF areas, the Coalition shells, and more than 260 ISIS members remain in farms east of Euphrates refuse to surrender. SOHR. 21 February 2019". ^ "Two Coalition (U.S) attack helicopters soaring the skies over the town of al-Baghouz, looking for ISIS targets". Map of Syrian Civil War - Syria news and incidents today - syria.liveuamap.com. ^ "Operation to end last IS Syria pocket hits evacuation snag". Reuters. 21 February 2019. ^ "French militant linked to Paris attack killed in Syria. 28 February 2019. Retrieved 1 March 2019". Startribune.com. 28 February 2019. Retrieved 26 March 2019. ^ "Thousands of civilians are still living under ISIS control, SDF commander says". CNN. 22 February 2019. Retrieved 26 February 2019. ^ "ISIS militants surrendered to Kurdish-led SDF tonight in Baghouz". Retrieved 26 February 2019. ^ a b "Thousands Evacuate Last Islamic State Hold-Out in Syria". Voice of America. 26 February 2019. ^ "JTF-OIR Press Release 20190227-01 Strike Release.pdf" (PDF). ^ "Severed heads found in mass grave near Syria IS pocket". Rudaw. 4 March 2019. Retrieved 28 February 2019. ^ Sang, Lucia Suarez (28 February 2019). "Mass grave with dozens of decapitated bodies found in last ISIS enclave: 'They were slaughtered'". Fox News. Retrieved 28 February 2019. ^ "US coalition confirms death of Fabien Clain, French militant linked to Paris 2015 attacks". Fox News. 28 February 2019. Retrieved 28 February 2019. ^ "Last civilians flee Syria's Baghouz as ISIS make final stand". 3 March 2019. ^ "US-backed force says it has taken positions in Daesh Syria camp". Middle East Monitor. 18 March 2019. Retrieved 24 March 2019. ^ a b c "Syria force launches assault on last IS redoubt". Yahoo! News. 1 March 2019. ^ CNN, Kareem Khadder and Ben Wedeman. "US-backed forces begin push against ISIS pocket in Syria". CNN. ^ "Die-hard ISIS supporters remain in Baghouz and also among those fleeing". Kurdistan24. 1 March 2019. Retrieved 2 March 2019. ^ "The Latest: US-backed Syrian forces to resume assault on IS". Washington Post. 1 March 2019. ^ "Daesh faces final territorial defeat in eastern Syria battle". Arab News. 2 March 2019. ^ "Islamic State deploys car bombs in defense of last enclave". Reuters. 3 March 2019. ^ "Syrian War Daily – 2nd of March 2019". 2 March 2019. Retrieved 3 March 2019. ^ "Syria force battles into last militant pocket". 3 March 2019. ^ "The caliphate is a hellscape of smoke and fire – Isis has nowhere left to go". 3 March 2019. ^ "Fierce fighting as SDF pounds last ISIL-held pocket in Syria". 3 March 2019. ^ "Syria force pounds holdout IS village". news.yahoo.com. ^ a b "US-Backed Forces Slow Assault on Last Shred of IS Caliphate". Voice of America. 4 March 2019. ^ "ISIS tactics slow SDF offensive on final enclave in Syria's Baghouz". Kurdistan24. ^ "Hundreds leave IS-held area in Syria as fighting slows down". 4 March 2019. ^ "Prominent French jihadis killed in IS-held area in Syria". The Washington Post. 4 March 2019. ^ "IS militants 'caught trying to escape' last Syria enclave". BBC News. 6 March 2019. Retrieved 7 March 2019. ^ "US-backed SDF to resume offensive against IS' last Syria enclave". 10 March 2019. ^ "More civilians leave Islamic State's Syria enclave, delaying final assault". Reuters. 9 March 2019. Retrieved 10 March 2019. ^ a b "SDF launches assault on last ISIS enclave in eastern Syria". The Guardian. 10 March 2019. Retrieved 15 March 2019. ^ "Heavy fighting reported as US-backed forces attack last ISIS stronghold in Syria". CNN. 10 March 2019. ^ Issa, Philip; Press, Associated (11 March 2019). "US-backed fighters make slow advance into IS pocket in Syria". SFGate. ^ "Gunfire, landmines slow SDF advance in ruins of Islamic State's Syrian territory". Reuters. 11 March 2019. ^ "SDF Says Assault on ISIS Pocket Almost Over". Retrieved 12 March 2019. ^ "'Tomorrow we'll be in paradise': Islamic State followers speak from besieged enclave". Yahoo! News. 12 March 2019. ^ "Syrian War Daily – 11th of March 2019". 11 March 2019. Retrieved 12 March 2019. ^ "Hundreds surrender with Islamic State near defeat". Yahoo! News. 12 March 2019. ^ "Baghuz Battle Against IS Remnants 'as Good as Over'" – via www.voanews.com. ^ "Islamic State counter-attacks out of final Syria enclave fall short: U.S.-backed SDF". Yahoo! News. 13 March 2019. ^ Barić, Joško (13 March 2019). "Syrian War Daily – 13th of March 2019". ^ "US-backed SDF says fight against ISIL enters 'final moments'". www.aljazeera.com. ^ "Hundreds surrender in last Islamic State enclave as SDF advance". Yahoo! News. 14 March 2019. ^ "SDF: Estimated 5,000 ISIS fighters and their families remain in Baghouz". Rudaw. 17 March 2019. Retrieved 19 March 2019. ^ "Daesh loses big part of Syrian enclave, SDF sees militants' defeat 'very soon'". 19 March 2019. ^ "US-backed force says it captured suspects in bombing that killed 4 Americans". Stars and Stripes. 19 March 2019. Retrieved 20 March 2019. ^ "Trump says IS territory in Syria nearly eliminated". 20 March 2019. ^ "Early celebrations as Syria war on ISIS holdout wraps up". Rudaw. 20 March 2019. ^ "ISIS caliphate has crumbled and last stronghold liberated, Fox News has learned". Fox News. 21 March 2019. ^ "US-Backed Force Denies Report of Islamic State's Final Defeat". VOA News. 21 March 2019. ^ "Airstrikes Target Last Defenders of IS Caliphate". VOA News. 21 March 2019. ^ "CJTFOIR Strike Releases March 26 2019". CJTF-OIR. Retrieved 26 March 2019. ^ Said, Rodi (16 February 2019). "IS 'caliphate' on brink of defeat in Syria as Trump urges Europe to do more". Reuters. Retrieved 24 March 2019. ^ "IS fighters held in Syria 'time bomb': SDF". sbs.com.au. 18 February 2019. Retrieved 24 March 2019. ^ El Deeb, Sarah; Abdul-Zahra, Qassim (21 February 2019). "More than 150 IS militants handed over to Iraq from Syria". Associated Press. Retrieved 24 March 2019. ^ Reuters; AP (1 March 2019). "At least 84 die fleeing Daesh in Deir Ezzor in east Syria: UN". Arab News. ^ El Husseini, Rouba (1 March 2019). "Guns and milk: What they carried from the 'caliphate'". Arab News. Retrieved 24 March 2019. ^ International Committee of the Red Cross (22 March 2019). "Syria's Al Hol Camp: Families in Desperate Need". Relief Web. Retrieved 24 March 2019. ^ Intelligence and Terrorism Information Center (2019), p. 2. ^ Intelligence and Terrorism Information Center (2019), pp. 1–2. ^ "No pressure to withdraw from Syria by specific date: US general". Al Jazeera. Al Jazeera Media Network. 7 March 2019. Retrieved 24 March 2019. ^ El Husseini, Rouba (8 March 2019). "'Blood up to your knees': defeated IS jihadists still defiant". Yahoo! News. Yahoo!. Retrieved 9 March 2019. ^ Hubbard, Ben (24 March 2019). "Explosion in Syria Kills Driver for NBC News Team". NY Times. The New York Times Company. Retrieved 24 March 2019. ^ "Islamic State Still Showing Signs of Life in Syria's Baghuz". Voice of America. 2 April 2019. ^ "SDF quelled jail break attempt of ISIS prisoners in Derik". ANF News. 6 April 2019. Retrieved 12 April 2019. "ISIS's media response to the imminent defeat in the village of Al-Baghouz" (PDF). The Global Jihad. Intelligence and Terrorism Information Center. March 2019. This page was last edited on 19 April 2019, at 14:11 (UTC).